It is common knowledge that a picture is worth a thousand words. In that sense, a photography competition can be termed as a contest to ‘see’ which picture speaks the most! Thus, it becomes an elocution competition of sorts. When Radio Sai threw out a challenge to all photographers out there, many waxed eloquent and the judging team was in for a treat. The photographs ‘spoke’ in different languages in different measures. While some spoke strongly based on the theme, some resorted to the language of creativity to expand the theme. Many spoke in the multi-faceted language of colours while some others chose to speak in the various tones and shades of the grayscale. One can only sympathise with the judging team which had to pick winners in this multi-lingual elocution competition. The punctuation and grammar of this photographic oration which the judges considered as a prerequisite were the technical aspects of the photograph - exposure, focus, sharpness and lighting. That was where the science of photography was tested. The next consideration was the interpretation of the theme. It was here that the art of photography was evaluated. Art-evaluation, as always, is hazardous because no two people have the same tastes. And therefore, we must accept, if these very same pictures were offered to another set of judges to evaluate, the results might have varied! Having said that, not many will be able to debate on the deservedness of the winners. The prize-winning entry comes from the category ‘Mother’. Only the mother’s arms and the baby are bathed in warm light while the rest of the space is black. It beautifully depicts what a mother is for her child - a haven of safety, light and comfort in a world which is otherwise unknown, dark and scary. The second prize arrives from the category ‘Prayer’. Again, the photograph speaks very simply and straight - a prayer leads one from darkness to light - and the photographer has captured this very well. The innocence on the face of the child also gives one a message on the attitude while praying. The third prize is from the category ‘Stillness’. 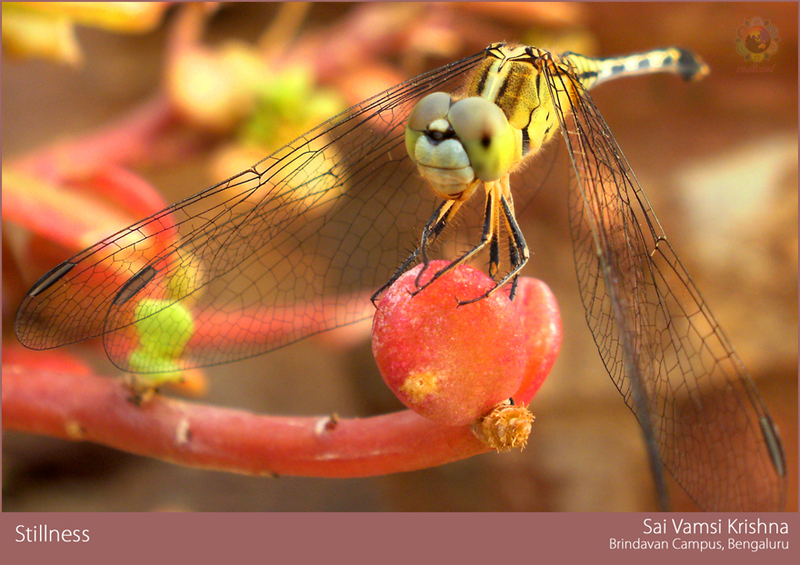 The magical micro-world gets revealed through a macro lens as a dragonfly enjoys a rare moment of stillness. The famous triangle-composition adds to the photograph. It was an interesting coincidence that the first three prizes spanned across the three categories. Apart from these, there were several images that caught the eye and were winners in their own right. 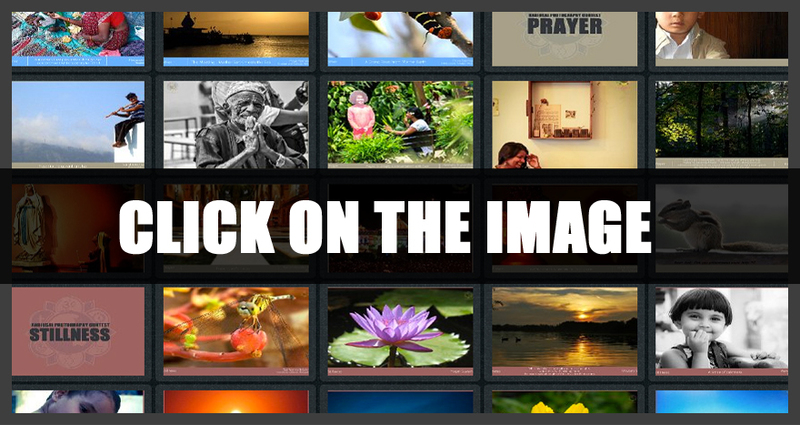 It is with great pleasure that Radio Sai offers these images for all to see and enjoy. Radio Sai expresses its deepest gratitude to Bhagawan Baba for the inspiration and experience of this photography competition. It also thanks all these enthusiastic photographers who sent in images that gave great pleasure and joy. What do you think about this contest and our judgement? Do you have suggestions for more such interesting contests? Please let us know by writing in to [email protected] Sai.org. Do not forget to mention your name and country.